I understand that for some on mobile, it's a bit difficult to find our contact details. 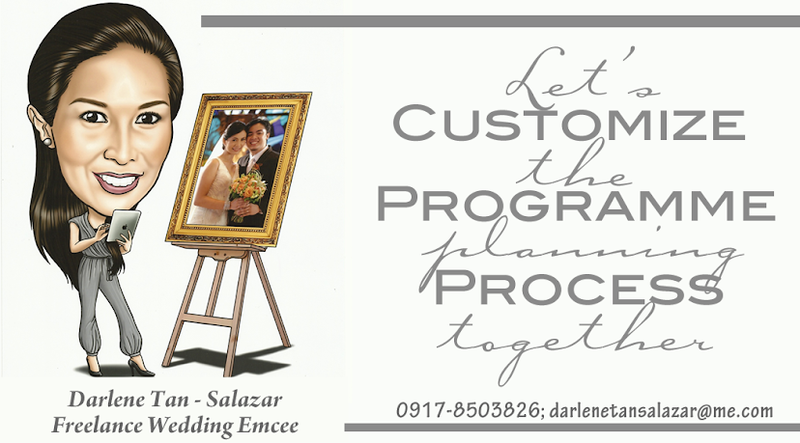 For inquiries, please email darlenetansalazar@icloud.com. Please include your names, date, time, and venue. You should get a response within 24 hours. When I joined Weddings at Work, I was just like most brides – I wanted a stress-free, near perfect wedding. That was in 2009. I attended the Christmas Party along with my then fiancé, Emman, and even told Atty. Fortun outside Blue Leaf that I felt he would be declared Supplier of the Year. We entered and after just a minute, the video played and declared him SOTY of 2009. In 2010, I was given the privilege of being part of the Top 10 roster. It was surreal since we had just started 6 months prior – no formal training, just a lot of wisdom and knowledge gained from being a W@Wie, and an overflow of devotion and passion which caused us to give 101% of ourselves to every wedding. 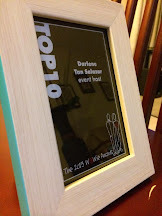 That decision to focus on emceeing started me on a three-year sojourn in the Weddings at Work Top 10 roster – 2013, 2014, and 2015. It was enough for me that my efforts were recognized. It was already an icing on the cake that I joined the Top 5 in 2014. I was not prepared for the 2015 SOTY Award. But the W@Wies have spoken… and I ended up on the platform with the emcees of the night, Bong Sare and Jason Magbanua. As Mimma Benz handed me the trophy, the words I wanted to say as I was walking towards the programme area vanished. Allow me to come up with something more structured… my own version of a TOP 10 List. 1. I want to thank God for bringing me into this happy field. I know I didn’t end up here by accident. 2. They say children speak the language of their mothers. That happens because their mothers are supposedly the ones staying with them the most. Since my mom gave up on having a career and stayed with me and my brother the whole time, definitely, we speak her language. Thank you, Mama, for all your efforts. I know even now, you’re with me every single time I stand up in front of a crowd. 3. My dad hails from a family of broadcasters. They say talking in front of people (and the camera) runs in the blood. (But make no mistake… I still get uncomfortable seeing myself on the screen when the couple gets a live feed set-up. Haha!) Thank you, Daddy, for being supportive – downloading songs for me, converting them, burning CDs, etc. 4. My brother, my cousins, and my friends who formed part of the team I had as coordinator deserve lots of accolades, too. They went with me throughout everything – tired feet, hunger, stress. Name it, they experienced it. Thank you, guys! 5. My niece, Juliana, who despite being annoyed that Tita is always out especially during peak season, still remains supportive in her own little ways. Thank you, Yana, and congratulations for your second stint at an international robotics competition. 6. I want to thank my sister-in-law, Shelly, for introducing me to W@W when I was still preparing for my wedding. I also want to thank my in-laws for understanding when I could not join family gatherings due to previously scheduled weddings. 7. I am immensely thankful to my W@W brides and grooms who made life easier for me because they gave me their trust and confidence. You don’t know how much of a relief it is for me to explain less – not only because I am trying to save my voice, but also because it makes planning more enjoyable when I don’t have to justify the points I have in my workbook. This doesn’t mean W@W weddings are easy. Far from it! Usually W@W weddings are challenging because of the level of detail involved, but it’s always great to be challenged to innovate and to analyze plans in order to avoid mishaps. Thank you also to those who recommend me to other brides and grooms – it is a source of joy to see former couples during receptions. Thank you to those who voted and gave me a chance to be Supplier of the Year for 2015. This truly means a lot, and because it does, it’s back to the drawing board for me to start innovating again… after all, the W@W culture is a culture of giving back. 8. I am grateful to all my fellow suppliers who have put in a good word for me, who always recommend me, and who tag me when they post about their weddings. Thank you also to the suppliers I worked with as a newbie – I learned so much from them. And yes, I would like to pay tribute to them in the coming days. Special mention to my FamiliaZ: Tito Boy, who not only helped me prepare for peak season with great gowns but also recommends me to his brides; Thoffy and team EBT; Mayone; Gretchen; Kiko; Abi and Alex; Mimma Benz, and last but not the least, Aisle 1401!! 9. I am deeply indebted to the founders of Weddings at Work, Sir Abet and Mimma Benz. As a bride, I know my life was easier because I had the W@W Community to share with and learn from as I asked questions and read posts. As a supplier, I had the chance to work with lots of W@W couples who are better prepared for their big days than those who didn’t join W@W. I also had the chance to meet with other brides & impart what I know through EBs and the blog. As a supplier, some consider me an “ate” of sorts and ask for advice when they go through difficulties perhaps, because of the tip sheet. I am truly thankful that I also have an “ate” in Mimma Benz because when I am at a loss, I know I have someone I can ask for advice, and when I make mistakes, I know there is also someone who will give me feedback so I can improve. Thank you, Mimma, for opening your heart not only to couples but to suppliers as well. 10. 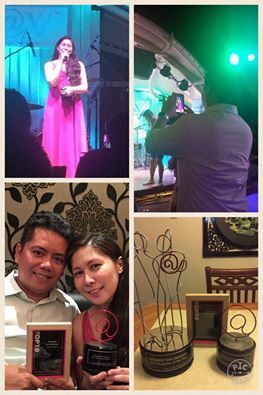 Lastly, I would like to thank my husband, Emman, because I know despite feeling left out or left behind during weekends, he has remained supportive of me and the industry I love. He could have asked me to leave already when he saw how invested I was in terms of time and effort after we had gotten married in 2010, but he didn’t. He even gave me feedback regarding what I can do to improve. For the great effort he gives to share my time with my weddings, I am truly grateful… because it’s not easy to find a job one can truly love and enjoy coupled with a husband who can support the job even if it is time consuming. If you got to this point after reading everything, and you’re a bride/groom preparing for your wedding, but you’re not yet a member of Weddings at Work, join now! You will definitely appreciate the experience of always having like-minded individuals you can communicate with 24/7 – yup, there are W@Wies all over the globe. If you’re not preparing for your wedding anymore and/or you’re a W@Wie already, please continue the W@W culture of giving back… there are more brides and grooms coming in and they would greatly benefit from the wisdom you’ve gained from your W@W experience. 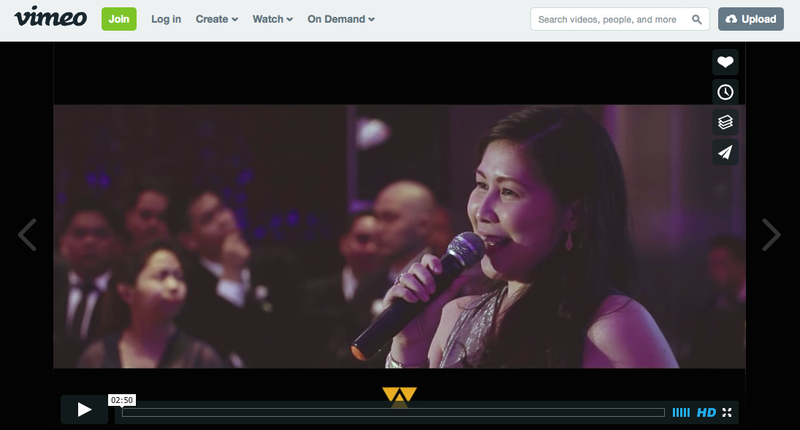 As an emcee, I've had my share of requests for video clips. While I do have some, taken a few years ago, I don't really want to send them because I feel the video clips only showcase part of what I can do. A video clip can't encapsulate everything in a few minutes, neither can all the possibilities happen in just one wedding. After all, wedding receptions are pretty unique occasions. Couples like to spend time thinking about the elements that would be part of their programme plans. That's why when I discuss with my couples and even when they diligently read and answer the workbook I give, I present options. There's a basic flow, a formula that works in terms of sequence, but they are not required to follow it to the letter given the nuances of their family traditions, their parents' requests, and the items they thought of including in the timeline. I never planned on hiring a professional video team to capture footage of a particular wedding. So definitely, the offer of WeCelebrate came as a blessing, so did the positive response of Dave and Anne as I mentioned that the video team would be coming in to capture footage of the programme. Thank you so much, Dave and Anne. Knowing how well-mannered and professional the team is, I knew they would find ways to take video clips without affecting the positions of the real photo and video teams of the couple. I also knew I would be in good hands because I've been working with WeCelebrate for some time now, and they haven't disappointed me -- from arriving on time during preps to keeping couples comfortable with the actual shoot, and on to creating memorable SDEs. While there are couples who prefer traditional elements and entrance segments, Dave and Anne chose to do fun group introductions given the nature of their parents, godparents, and entourage. Trivia number 1: Did you know that the godmothers requested for a different song? They said they wanted something of their era, so they danced to the tune of "Uptown Funk". How cool is that? Trivia number 2: I needed to stall a bit more. And guess what, the stalling became an absolutely fun part courtesy of the godparents. I actually asked for Anne's permission to change the participants because the members of the VIP were really so participative all throughout, so I chose the godparents to take part in Game 3. We had a 3-hour programme but we ended with almost all of the guests who were there at the beginning. Trivia number 3: I do not force this kind of programme on all couples. Yup, couples have a choice as to what kind of programme they wish to have -- some want things loud, some want everything to be subdued and formal. Whatever the choice, I only have one reminder, "Please match the requests with the general personality of the guests. That way, they will be able to relate to the programme and they will stay and finish it with you". For the latest emceeing package, please don't hesitate to send us your date, time, and reception venue. Contact Form: Pls send your date, time, and venue. Do you know what causes couples the most stress a week before the wedding?